Not many people can say they were associated with two different national championship teams in the same year, but Dome a coach at Florida State, Michigan, Colorado, Kent State and eventually the head coach at Washington. Don James will always be considered a premier quarterback at "Quarterback U". 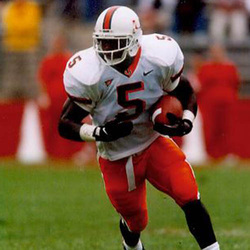 Edgerrin is one of the most prolific and exciting running backs in UM history ! He came to Miami out of Immokalee (FL.) High School where he also played linebacker and handled kickoff and field goal duties and was named a Parade All-American. He is the only Hurricane running back to post consecutive 1000+ rushing seasons and ranks 2nd in school history with 2,960 yards, despite starting only 17 games. His 35 total touchdowns is tied for the schol record with Stephen McGuire, while his 32 rushing touchdowns is 2nd. He is tied for the school record with fourteen 100+ yard rushing games and had 12 multi-touchdown games in his career. He is also 3rd in rushing attempts (474), and 3rd in all-purpose yards (3,590). His 1,416 yards rushing in 1998 was the most to that time of any Miami back (now 2nd) and set a Big East record, and his 17 touchdowns that year shattered Eddie Dunn's 60-year old school record of 14 touchdowns in 1938 ! He also holds the freshman rushing record (446 yds.). "Edge", as he is known to teammates and fans, saved his best for the big stage, and nothing points that out better than his school record 299 yards in 39 carries performance in the Canes 49-42 upset victory over #2 UCLA in the Orange Bowl in December of 1998 ! He was named first team AP All-Big East, Football News All-Big East, and Football News honorable mention All-American. James was drafted in the first round (4th overall) of the 1999 NFL draft by the Indianapolis Colts and was named the 1999 AP Offensive Rookie of the Year. As of the 2008 season, he was the NFL's active rushing leader with more than 12,000 yards. He established the Edgerrin James Foundation and his annual Charity Basketball Classic benefits the foundation and his old high school.